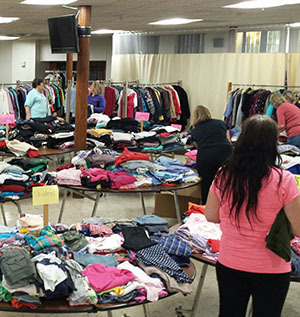 Thrift Mart is a church-wide community rummage sale providing quality merchandise at bargain prices. From clothing to housewares and everything in between, you’re sure to find just what you’re looking for. Thrift Mart happens twice a year--April and September--with donations accepted one month ahead of each sale. Recognizing the needs of our community, Thrift Mart is one way we reach out to help. Sponsored by the United Methodist Women of St. Paul’s, our profits go to meet our mission pledge and to support our local church and community projects. It is a win-win project for missions, the community, and our own homes. Good food is available at reasonable prices during the sale. Drive-up drop-off is available at the 2nd Avenue entrance. For high-value items and collectibles, the church now also has the online SuperStore. So feel free to bring ALL of your donations to St. Paul’s and know that we will make every effort to sell them for their optimal value for missions. On the second day of the sale at 11:00 am, the Big Bag sale begins. We sell a garbage bag for $1.00 and customers fill them to the brim. (Free bags are available for those who cannot afford the dollar). 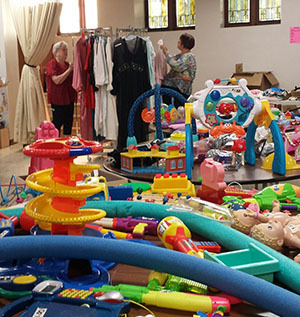 To take a tax deduction for items donated to St. Paul's Thrift Mart, you will need to submit an itemized list of your donations to the church office or send to office@stpaulsumc.org. Be sure to include your name, complete address, and the date items were donated. A copy of your list will be returned to you along with an attached letter verifying that the items were donated. The letter also states that the value placed on the donated items was determined solely by you as donor. Questions may be addressed to Thrift Mart chairs Doug Thompson, Becky Holstrom, Ed Holstrom, and Marla Nikodim. To volunteer to help with Thrift Mart, call the church office at 319-363-2058. We will have a spring Thrift Mart on Tuesday, April 9, 2019, 9:00 am-5:00 pm and Wednesday, April 10, 2019, 9:00 am-1:00 pm. Help support this mission project of United Methodist Women adn the whole church. It is a win-win project for missions, neighborhood, and our own homes.